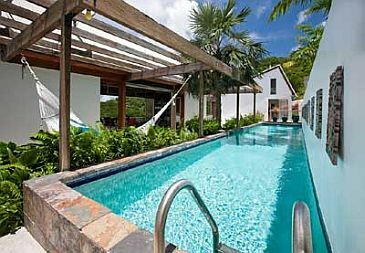 Located on St John, The Retreat is designed to accommodate up to 10 guests, its two a/c separate bedroom suites allowing families or couples to enjoy complete privacy, and features a lap pool, Jacuzzi, a private path to the beach, a gourmet kitchen, and much more. 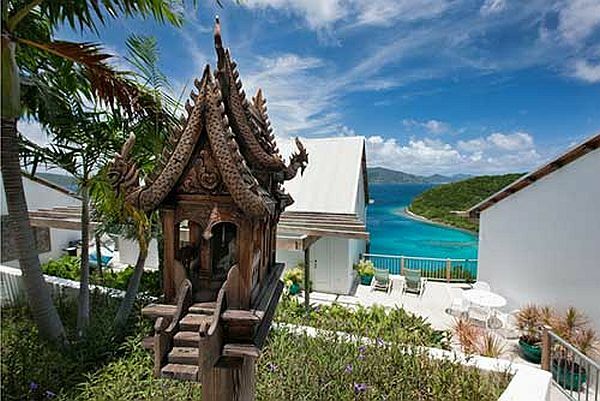 There are three quietly elegant pavilions centered around a private garden courtyard, on a hillside above beautiful Dreekets Bay on the secluded east end of St. John, USVI. A 40′ lap pool runs the length of the courtyard. 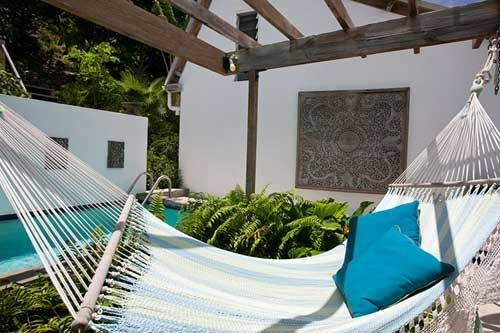 Comfortable lounge chairs on the deck around the pool create an ideal spot for private sunbathing. A large Jacuzzi surrounded by tropical landscaping provides the perfect spot to unwind. 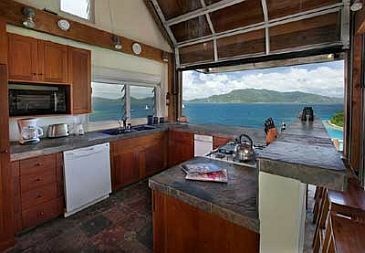 The well-equipped gourmet kitchen in the main pavilion offers ocean views as well as a gas stove and oven, refrigerator, dishwasher, microwave, trash-compactor, professional quality cookware, and an eating bar. A laundry area with washer and dryer is adjacent to the kitchen. 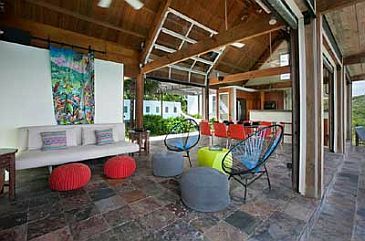 The living room of The Retreat, also in the main pavilion, contains comfortable seating and dining areas, along with satellite television, WiFi internet access, VCR, DVD player, surround-sound Hi-Fi, and library of books and movies. The pull-out couch transforms into a queen bed to accommodate extra guests. 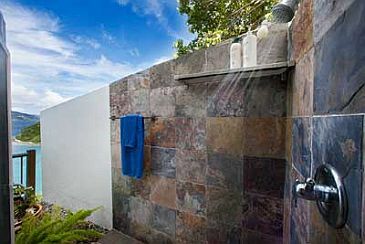 On either side of the main pavilion, each of the two bedroom pavilions contains a king bed, a loft with an extra double bed (accessed by a pull-down wooden ladder), a separate bathroom and an outdoor shower with ocean views. 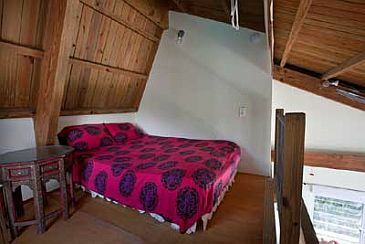 Both bedroom suites are air-conditioned and are equipped with ceiling fans. 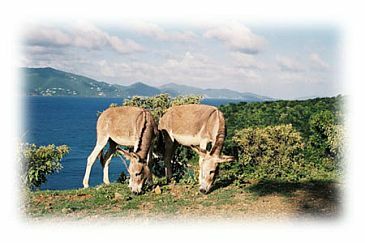 Stunning views of the bay and across Sir Francis Drake Passage to the magnificent island of Tortola encompass you as you approach The Retreat by road. 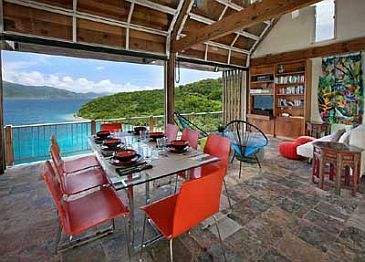 Each room of the house is oriented to maximize these sweeping vistas, second to none of St. John. 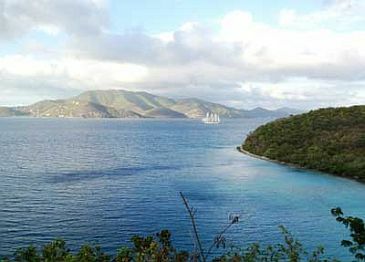 No other homes overlook The Retreat, and across Dreekets Bay from the house lies the untouched landscape of Virgin Islands National Park. 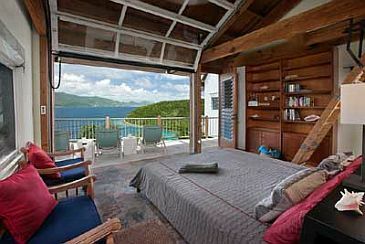 The front of each pavilion is a glazed rollup door, allowing the entire wall to open up to tropical breezes and the view. 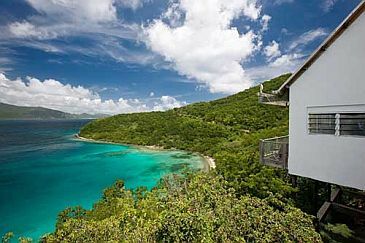 Just 110′ below the house down a set of stairs and a private switchback trail, the secluded sandy beach provides a perfect spot for sunbathing, snorkeling, or pure relaxation. Payment is accepted by money order, check, or credit card. We are happy to answer any questions that you may have regarding The Retreat. 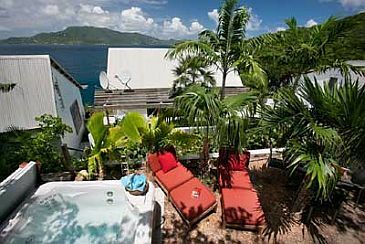 40′ lap pool, jetted hot tub, ceiling fans in all rooms, surround-sound stereo, fine linens for bed and bath, “memory foam” mattresses, outdoor beach shower next to beach trail, beach towels, chairs, and picnic coolers, 120-channel satellite TV, and automatic roll-down insect screens. Daily maid services, as well as full or partial catering, are available upon request (with additional fee). 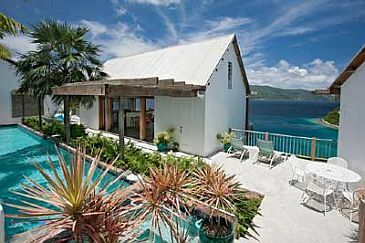 Come stay with us, and discover the pleasure of a perfect place, a place to simply be. 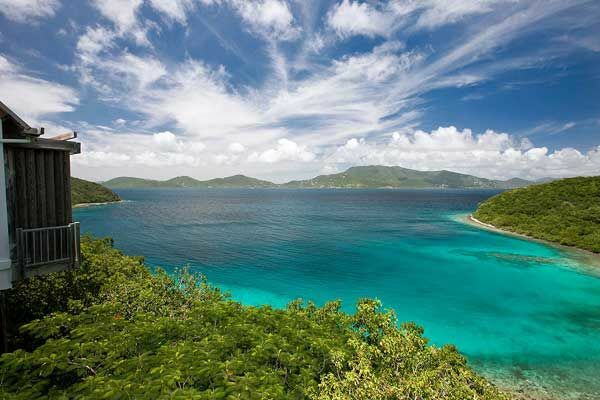 Located on the pristine east end of St. John, Dreekets Bay is known among locals for having some of the best snorkeling and diving in the Caribbean. 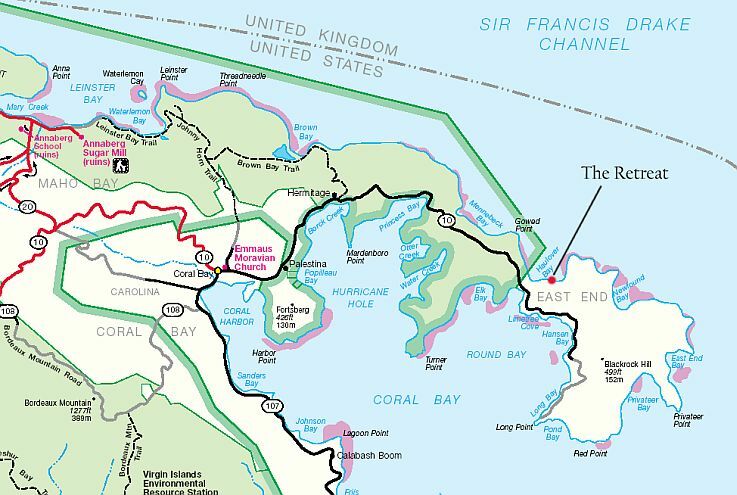 Reached by a scenic drive through the National Park along paved roads from Cruz Bay, the location of The Retreat offers an experience of untouched, secluded natural beauty just a fifteen minute drive from outstanding restaurants featuring local and continental cuisine in Coral Bay..